In the world of photo editing Adobe have had very little in the way of serious competition. Photo Director 4 from Cyber link would love to change that so let’s find out if it’s got what it takes. Verdict: PhotoDirector 4 is surprisingly good at what it does. 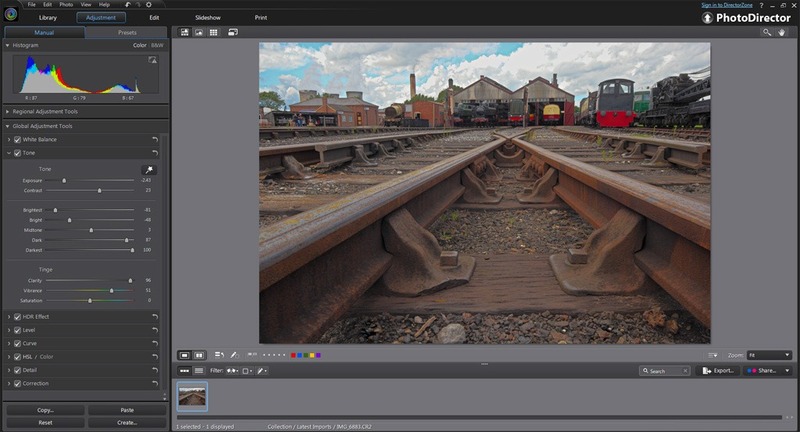 It borrows heavily from the design and interface of Adobe Lightroom 4 and it even throws in some neat tricks of its own. It’s just a shame that PhotoDirector can’t match the image quality gained from using Lightroom 4 that it mimics so closely. 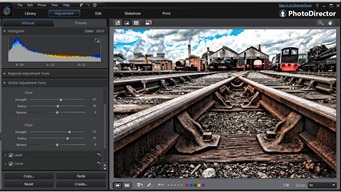 As a die hard fan of Photoshop it seems very strange using a bit of software that doesn’t come from Adobe but PhotoDirector 4 has a uncanny familiarity about it. In fact if someone had told me that this was a beta version of “Lightroom Elements” I’d have totally believed them. 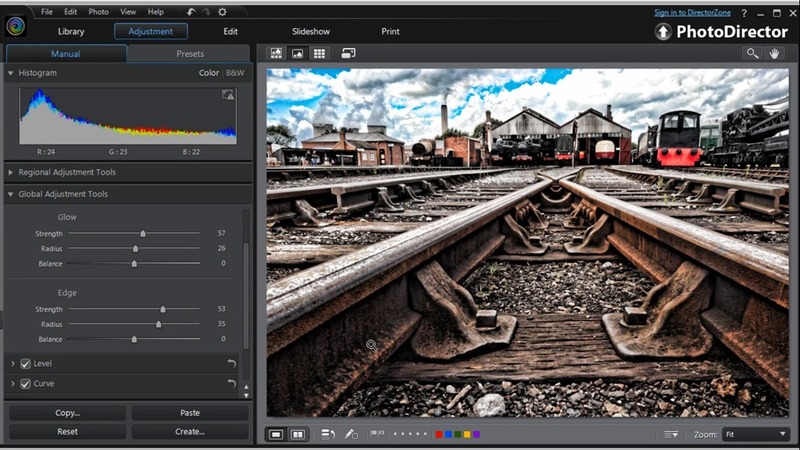 At its core PhotoDirector 4 is a photo organiser and photo editor that can handle pretty much any photo format you can throw at it, including RAW files. The program is split in to five modules which are the Library, Adjustment, Edit, Slideshow and Print sections. You move from one section to another making changes as you go. You can see Photo Director 4 in action by watching my overview video below. Editing your photos is PhotoDirector 4 is a pleasant experience. There’s lots of controls at your disposal and adjustments are applied live to the image on screen. The changes appear almost instantly, although there is a momentary delay before the full resolution effect is seen on screen. I did find one annoyance however, the interface had a habit of regularly not moving the slider I was dragging. In the Adjustment section there’s a great selection of preset effects on offer with the option to create your own too. Sadly you can’t make presets for other sections, such as Print, which is a shame. It’s impossible to use PhotoDirector without comparing it to Lightroom but there’s also a bit of Photoshop Elements in there too. There’s a Liquify brush, a skin smoothing brush and a teeth whitening brush. There’s also a brilliant Pseudo HDR effect which was possibly my most favourite feature and not something you’d find in either Photoshop Elements or Lightroom. If you’ve no wish to use an Adobe product then I can whole heartedly recommend Photo Director. If you’ve tried Lightroom and found it lacking in features, I can honestly say Photo Director is well worth a go. It’s the image quality that really matters of course and here PhotoDirector 4 held it’s head high on most adjustments. Processing RAW files gave some great results with noise free images with good sharpness and colour. It all sounds and looks great… until you compare it to the image quality obtained in Lightroom or Photoshop. Sadly much as I liked PhotoDirector, I can pull far more out detail from the shadows and highlights in Adobe Camera RAW. I can also add much more clarity and the experience of doing so is far more fluid. That said Adobe need to watch their back as the gap between them and the competition is closing. as a linux user i find it annoying to constantly switch to a mac to process raw files. do you have any experience with linux-based raw processing software? i’ve found a few that are, well, ok, but nothing that comes close to ACR. Sorry Nick. I don’t have any experience of Linux. CyberLink’s Photo Director felt like a poor mans LR back when it first came out in 2010, due in part to a large price gap (LR @ $300, PD @ $80). Things have changed a bit since then, but it’s nice to they are still in the game. As to Nicks question, have you considered Corel? They have AfterShot pro which is similar to ACR/LR and is Linux compatible, and might fit the niche you are looking for. ironically i was coming back to this post to update my findings and yeah, AfterShot Pro is amazingly good! no clarity slider though… we all love a bit of clarity.